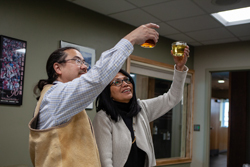 Sealaska Heritage Institute (SHI) has announced the winners of its traditional food contests, held as part of Celebration 2018. The judges rated the entries on taste, color, smell and freshness. This year, SHI added two new categories: best seal oil and best seal oil with crackling (fat). Racean Fredrickson of Angoon took 1st place for best seal oil; Don Bolton of Metlakatla took 1st place for best seal oil with crackling and 1st place for best seaweed. Second and 3rd place awards for seal oil went to Roberta Revey of Kake and Bolton; 2nd and 3rd place for seal oil with crackling went to Fredrickson and Wanita Bunny James of Kake; and 2nd and 3rd place for seaweed went to Linda Rae Shearer of Metlakatla and Johnny Jack, Jr., of Angoon. Winners of the contests were announced onstage on Friday at Centennial Hall. The top three were awarded prizes of $500, $250 and $100. The event also featured a demonstration on how to make soapberries by Louise Gordon, who won SHI’s first soapberry contest in 2008. The institute sponsors the contests to introduce young people and the public to traditional Native foods and to highlight the health benefits of Native cuisine. The practice of subsisting off of the land also ties Native people together, said SHI President Rosita Worl. SHI Chair Marlene Johnson told a crowd at Centennial Hall that she puts up smoked gumboots, coho salmon, sockeye salmon, sockeye strips, canned halibut, soapberries, apple butter, wild strawberry jam, najoon berry jelly and seaweed every year. “I would say a good 50-75 percent of my food is natural food,” Johnson said. Desiree Jackson, a nutritionist with the Southeast Alaska Regional Health Corporation, said traditional foods, such as salmon, seal oil, herring eggs, seaweed and seal meat, are so healthy that parents should be introducing them to babies and that mothers should be eating them during pregnancy.